Mix the flour and water together, then add in the baby shampoo. And really, the measurements are more a guideline… if you’ve got baby shampoo in pump form, just do a few pumps and keep mixing until the paint reaches a nice, fluid consistency that you like. Then add in the food coloring and stir well until everything is smooth. I mixed up paint in a littleÂ ramekin and then poured each color into its own compartment of one of Liam’s toddler plates. 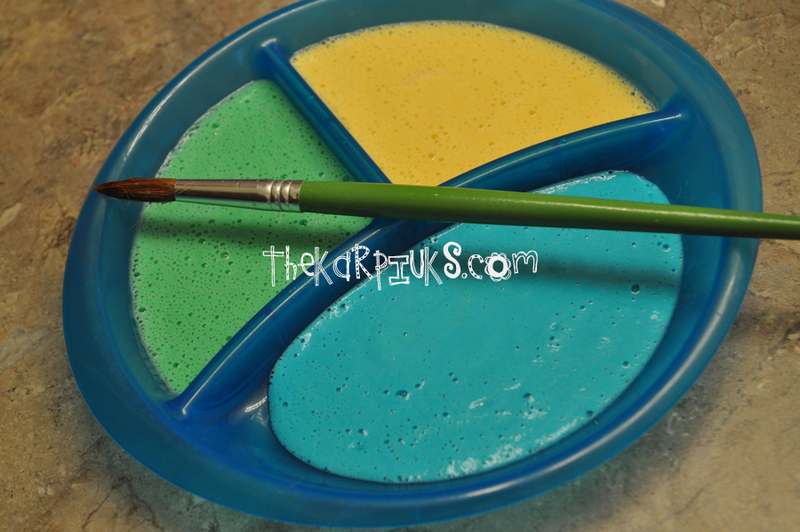 It took about 4 minutes to whip up a plateful of different colored bathtub paint, and that included gathering the materials from the pantry and rinsing the ramekin in between each color. Liam had a blast! 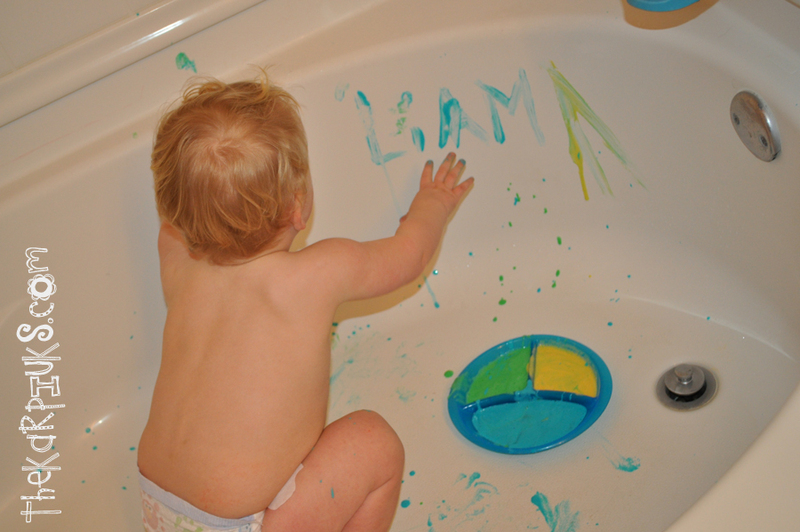 We stripped him down to his diaper and set him loose in an empty tub with hisÂ palette.Â I gave him a big paintbrush at first and used it to write his name in paint on the tub wall to get him started, but it took no time for him to realize that using his fingers and toes was a whole lot more fun. The “paint” got everywhere and he made a huge mess in the tub (and all over himself), but it all easily wiped away clean with just a little water, without staining. When we were finished, I just filled up the tub and had Liam help me rinse off his plate and the paintbrush in the running tub water. Then it was normal ol’ bath time! 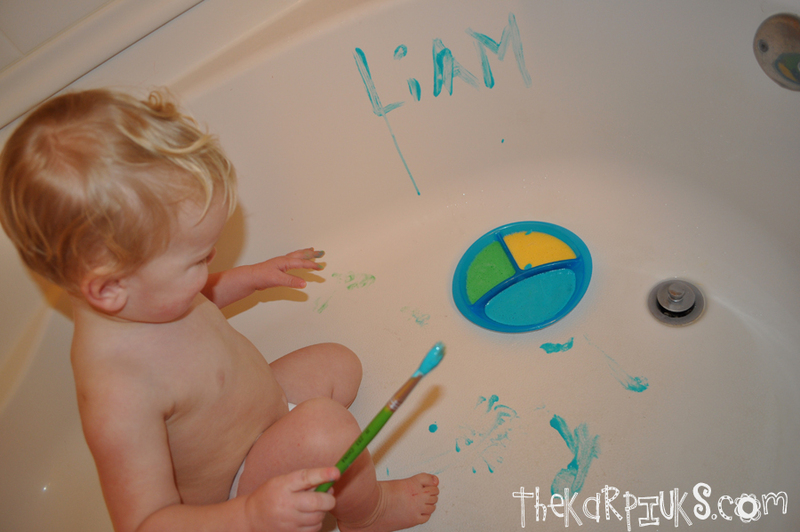 So quick (cheap) and easy, and Liam really enjoyed exploring with the paint in a new way. The tub was his canvas! I’m going to miss having so much time every day together when we all go back to work and school on Monday, but I sure am thankful for all of the memories of the family time and activities we got to do together these last two weeks! 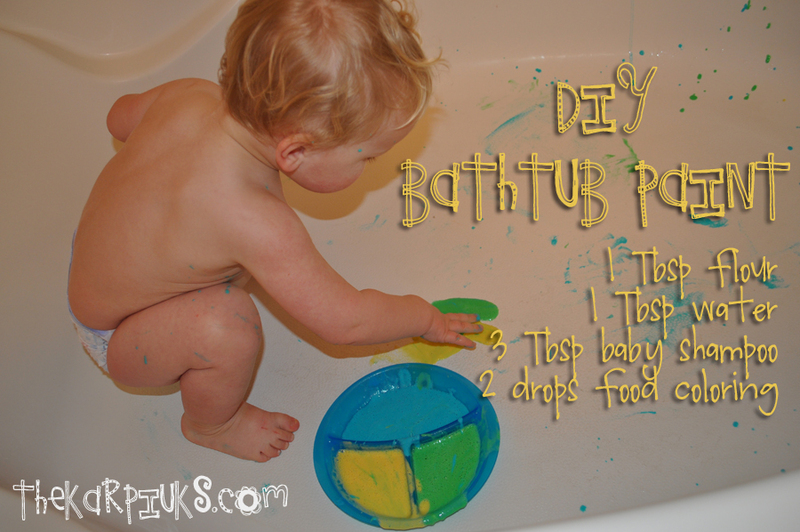 We’ll definitely be making more bathtub paint in the future – I’d love to do a mixing activity with it to show Liam how to make different colors, too. 2013 is already off to a great start full of family fun. Can’t wait to see what else we do in 2013 together!